Following a memorable 2012 season, the American Drag Racing League (ADRL) announced its Special Awards winners at its annual Racer Appreciation and Awards Gala. Eric McKinney was named the 2012 ADRL Driver of the Year after winning seven events and an ADRL world championship in Pro Extreme Motorcycle. Todd Hoerner was the choice for the 2012 ADRL Rookie of the Year following an event win and a top-10 finish in Extreme Pro Stock, while zMAX Dragway, which hosted an ADRL event (Dragstock IX) for the first time, was named the 2012 ADRL Track of the Year. 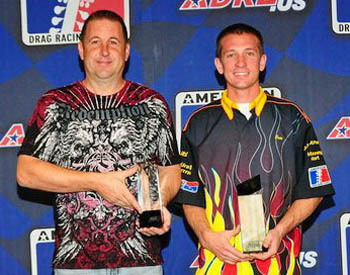 McKinney had a breakout year and it turned into one of the best seasons by any competitors in ADRL history. In winning seven races, including five straight to end his impressive season, McKinney advanced to a whopping nine finals and was the No. 1 qualifier five times, cruising to his first world championship by earning more than 5,000 points in 2012. "You want to do well and you think you can do well, but this is just unbelievable and on a whole other level from what we had hoped. It's unbelievable," McKinney said. "It's incredible and it is just overwhelming to have a year like this, and then win an award like this. The ADRL has given us a great place to race and this class is the toughest class I've ever raced in. To win the championship, it just means a lot, and then to get something like this, I almost can't explain it. It's just amazing." McKinney went as quick as 4.02 on a bike built by 2011 ADRL World Champion Ashley Owens, who was a crucial part of McKinney's team in 2012. With a bike that delivered one consistent run after another, McKinney also praised a standout team that helped produce his spectacular season. "It's all about having good people around you and I can't say enough about everyone on this team. With my dad, Ashley and everyone else, there are a lot of great people on this team helping make things happen. The job they do is just amazing and I owe all of this to them." Hoerner made his ADRL debut at the second race of the season at Bristol Dragway and it didn't take long for him to make an impression driving a stunning 2012 Camaro from Jerry Bickel Race Cars. In just his third race Hoerner won his first ADRL event, going as quick as 4.04 to claim the victory at the Gateway Drags IV presented by CarSafe. It was a historic first win, too, as Hoerner, an employee at Sonny's Racing Engines, became the first driver in Pro Stock history to win an event using electronic fuel injection (EFI). "An award like this means a ton, and it's an honor to get it, especially considering all the competition and great racers in the ADRL," Hoerner said. "I'm super happy for my crew chief, Jeff Dobbins Jr. Without him, this would not have been possible. He made the right calls all year." In one of the most competitive classes in the ADRL, Hoerner and his team, which also includes his wife, Nicole, and his daughter, Kassidy, was remarkably consistent and stayed as a championship contender for the majority of the 2012 season. "Our goal this whole year was just to qualify and maybe go a round here or there. We just kept working on the car and it kept improving race after race," Hoerner said. "At the end of the season, it felt like we had one of the top cars. I'm still trying to let this all sink in. "It was an outstanding year and I'm super thrilled with the results. They went beyond my wildest expectations for this year." The ADRL made its debut at zMAX Dragway in Charlotte in August, as it became the new host for the ADRL's most prestigious event, Dragstock. The event turned into a massive success, drawing rave reviews from fans, ADRL executives, sponsors and race teams. "ZMAX Dragway is obviously one of the premier facilities in drag racing, and it was a huge thrill to be able to have Dragstock there for the first time in 2012," ADRL Executive Vice President Jeff Fortune said. "With an excellent fan turnout, it provided an unbelievable atmosphere for our competitors, and it ended up being an outstanding weekend for everyone involved."